Board Members - Just Kidding Theatre Company, Inc. Though she is lives in the City, Kim will always be a Jersey Girl at heart. As a child growing up in New Jersey, she played soccer, took dance and riding lessons but the one constant in her life was acting. While attending a nationally renowned performing arts program for the gifted and talented at Somerset Vocational & Technical High School in NJ, she was consistently busy with shows and studying voice privately with Michael Stuempfle. Through VoTech she learned the necessities to put on a show. Every year you had to work behind the scenes either doing Lights, Props, Scenery, Sound, etc. Thanks to this she got a chance to do be an Assistant Director to BJ Soloman and to Stage Manage shows at Shetler Studios for Ron Shetler. And for three years during the summertime she worked at Villagers Theatre Arts Conservatory. 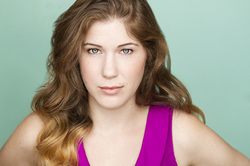 After finding her way to the Big Apple, Kim began studying the Meisner technique in depth at Neighborhood Playhouse School of the Theatre. She blossomed under the tutelage of Meisner devotee Richard Pinter and James Brill and allowed her singing voice to fully develop with Ron Shetler. She loved exploring film with director John Gallagher and has developed a real interest in off-beat movies. When she is not involved in a show, she can usually be found at the gym, reading a good book, catching a great movie, and if the weather allows, relaxing in Central Park. One of her favorite things to do on a Wednesday night is to volunteer at the Veterans Hospital with Veteran's Bedside Network doing old radio readings in the detox ward. Kim loves Country music, and applies its lessons to her own life. Who says you can't go after your dream and have fun at the same time? It's the only way to do it. Sometimes your heart pushes you to places you never thought you'd go. After Elohim got accepted into the William Esper Studio's two year Meisner program, he essentially restarted his life. He left his family and friends in Minnesota, not to mention school, to follow that dream he'd always had but never acted on. He never looked back. He dived into his craft, and reinvented himself. He studied with acting Barbara Marchant, movement with Ted Morin, and voice and speech with Nancy Mayans. And in doing so, the extremely shy quiet, smart kid found his confidence, his charm, and his charisma. He had a rough start, but soon he found that the harder life pushed down on him, the harder he would push back, and that nothing could hold him from becoming the person he was meant to be. Elohim originally joined the company as an actor for their debut project, a production of Dog Sees God: Confessions of a Teenage Blockhead playing the role of Van and officially joined the board in July of 2012. He is also part of a web series that will be premiering August 2012 called Losing Grip; he was signed on when the managers of White Bamboo Productions went looking for an interesting male with a story to tell. He is currently working on another web series called Behind Closed Eyes, set to premier next year. When he’s not acting, Elohim is an avid gamer and part-time nerd. Matthew's involvement with JKTC came after acting in Living Dead in Denmark. The experience was such a positive one from an actor's point of view, Matthew wanted to contribute more to the production of the shows. He is also a writer and director so appreciates the amount of work that it takes to get a production off the ground and into the theatre. He is a graduate of Pace University's BFA Acting Program and the William Esper Studio. Sue’s journey to producing theatre has been a montage of varied experiences over many years. She appeared on the professional stage in Florida at the age of 10 and cut a record of religious recordings with a church choir as a pre-teen. Sue left the entertainment world while she pursued sports in high school. She trained as a Spanish teacher but worked in advertising for 10 years doing market and media research as well as planning and implementing multimedia campaigns using print, radio, television and outdoor advertising. Then she left the corporate world to raise a family but maintained her interest in marketing through a plethora of volunteer positions: Marketing consultant for the Center for Orthopedic Care, President of Somerset Medical Center Auxiliary – raised upwards of $1M/year using fundraising and recognition events. Church Leadership Team – over 4 terms, wrote mission statement for institution, coordinated all social activities, developed all new marketing materials and website and was an adult leader to teen service project in Appalachia for 3 years repairing, rebuilding, and renovating homes. Sue returned to the workforce as a business owner setting up two businesses: a direct sales organization with 500+ sales force and an interior redesign, staging and organization company. She serves on the Board of Trustees of Keuka College, her alma mater as well as Friends 4 Kenya, a non-profit that empowers young women. Finally, she sits on the Board of Directors of Just Kidding Theatre Company, Inc where she is responsible for all the business filings and application of 501©3 status for the company. Additionally, shehas served as a major producer of all our productions not only providing the funding but she also works as the Business and Operations Manager of the company.